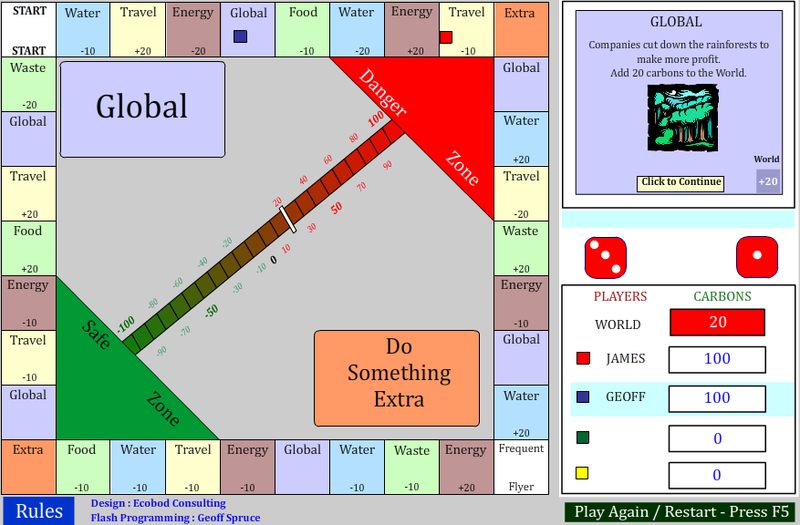 Manchester Climate Monthly readers – before learning about the “Go for Green” board game, please go read and I hope sign this petition (if you live, study or work in Manchester). Tell all your family and friends and casual acquaintances. Now, let the games commence, via an interview with James Ridgway! The Go For Green carbon footprint game started life in 2011, in response to the (then new) Manchester Carbon Literacy Project. I’d always wanted to create some kind of sustainability energy training suitable for adults and young people, but despite eight years working in Manchester’s environmental education sector the opportunity never arose. Then along came Manchester Carbon Literacy, which aims to give every employee, resident and student in Manchester – over a million people – access to a full day’s carbon literacy training. Better yet, the organisers (Cooler Projects) were seeking partner organisations to help Manchester achieve its ambitious goal. I worked with several teachers at St Peter’s High to create a six lesson scheme of work (SoW) that could meet the targets of both MCL and the national curriculum. To engage students of all abilities we built the lessons around game design and kinaesthetic skills (learning through doing). When the SoW is finished, students who complete the lessons to a suitable standard will be eligible for the MCL carbon literacy certificate, which is accepted by local employers. Ironically, the game itself has overshadowed the scheme of work that spawned it. While an online version and an oversize floor-based version of the game are already available to play, the original scheme of work is still in development. The scheme of work has been trialled with two year seven and one year nine class. 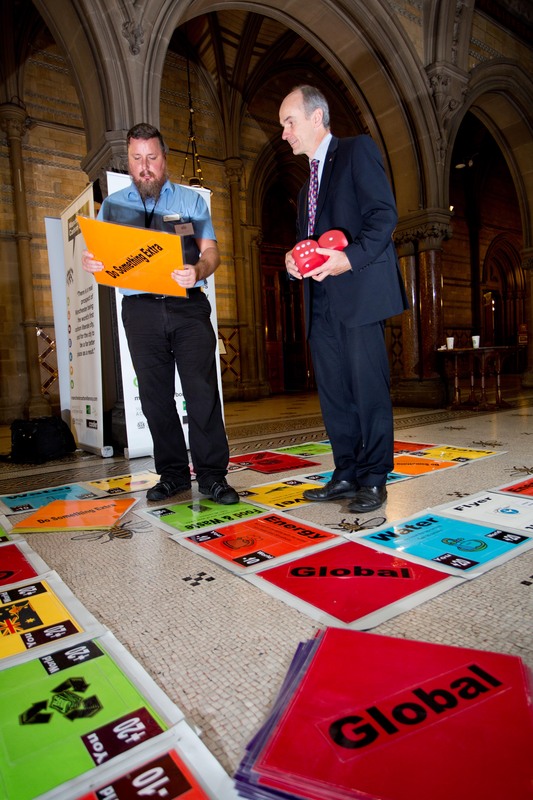 The floor version was showcased at the public launch of Manchester Carbon Literacy in the Arndale Centre in March 2013, where it was enjoyed by members of the public. It also featured at the Mancunian leg of the British Energy Challenge, where it was played by the Professor David Mackay, chief scientific advisor to the Dept. of Energy and Climate Change, among others. Students from St Peter’s also took the floor game to another local school, and introduced it to visitors from the Business and Enterprise Specialist College network run by the Co-operative College. An online version of the game has been played by people around the world (including from the UK, USA, Japan, Australia, China, India and S.Korea). Apparently, some Japanese parents are playing it with their children as a way to teach them English. Depends on the number of players. A two player game can take as little as ten minutes. What feedback do you get – does it start conversations, are people surprised? The feedback is all positive. People like the idea, even if they only watch. Despite the scheme of work not even being ready, several City Councillors are already eager to disseminate the lessons to every high school in Greater Manchester. Is it going to change in response to the feedback/due to changing circumstances? Following the suggestion from Japan that parents could use the game to teach their children English, St Peter’s is considering using the game for a student translation project with our link schools in China and elsewhere. The aim of the scheme of work is for teams of students to create their own versions of the game, so the content will change every time. If people are interested, how can they play it? Special mention should go to Geoff Spruce from St Peter’s IT support team, who sacrificed many hours of his own time to program the online version, and to the Technology teachers and two yearr 9 classes of students who made the floor based version. The go for green scheme of work should be ready for classroom testing in January 2014. St Peter’s is also developing a six lesson ‘Green Careers’ scheme of work for Key Stage 4 students. James Ridgway is a science fiction writer and artist who pays the bills by providing global education consultancy to St Peter’s RC High School. He helps teachers to include environmental sustainability and a global dimension in their curricula. His aim is to minimise teachers’ workloads by meeting multiple targets with single pieces of work and then embedding them in the curriculum so they can be repeated in future years. This entry was posted in education, Energy, Fun, GM Climate Strategy and tagged decc, Go for Green. Bookmark the permalink. I would really love to play this with my AP Environmental Science students, but I can’t find the digital version anywhere. Can I get an assist if possible?